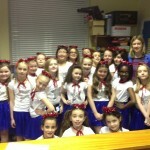 Ms. Coyle’s 3rd/4th Class put on an amazing performance in the St Mary’s Concert on Wednesday night! They performed a selection of songs and dance routines in ‘A Tribute to Walt Disney’. Thanks to Mrs. Connolly for all her hard work to prepare them for their big night! !